Richard Russell: "Something Has To Give"
Legendary investment newsletter writer and commonly referred to as the "Godfather of newsletter writers", Richard Russell was interviewed by The Economist magazine recently. The article discusses the current economic conditions as compared to the last half century and basically ends with the phrase "something has to give!" Mr. Russell's response--What is it that might give? Could it be the price of Gold? Gold could rocket higher when it is widely accepted that it is the only real and trustworthy money, money that needs no counter-party and that Gold is the only money that has no counter-party. Gold is wealth on its own. Every nation in the world can collapse and Gold will still represent unquestioned and eternal wealth. This from a man who has been at it for over 50 years and has earned high respect in the financial markets. Whatever they're doing, it's NOT working? Before we get into all the negative opinions about Gold, we must understand why the mainstream media, banks, financial institutions and government all down play Gold as an investment. People must study history to understand that Gold keeps bankers and politicians honest and disciplined. And the banks, government, schools and media are all working together to conceal the truth. There is much more to it and many books have been written on this subject, however we must accept that there is a fundamental reason why the forefathers of America used Gold & Silver as a backing to the currency of America. Gold pays no interest or dividends: Who cares, Gold has returned over 500% in the past ten years and 16% annually over the same perion. How did your "diversified & balanced" portfolio do without Gold? Click here to see a chart of Gold compared to the S&P 500 including return on dividends. In the end, nothing else would do for Scotiabank (BNS-T50.12-0.06-0.12%) but that Amar Patel – 73 years old, bald from chemotherapy, in the throes of metastatic breast cancer – should drag her aching bones down to the bank’s head office in downtown Toronto. Straight from Peter Munk himself. 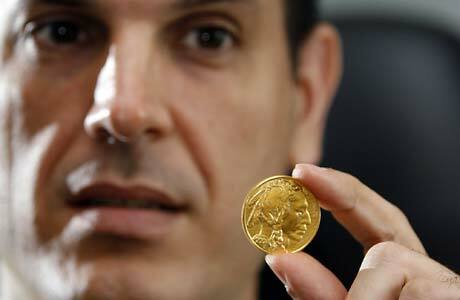 Bosko Kacarevic is putting his faith in gold. He is going a giant step further than investors who are buying the precious metal for inflation protection, as insurance against currency collapses and in hopes the price will continue to escalate. He is staking his livelihood on it. Last month, Kacarevic left a job as a consultant with Investors Group in Windsor to set up his business as an independent gold broker/dealer. For more than a decade, the markets have made a fool out of the conventional “wisdom” that stocks are for buying and holding. During the last eleven and a half years, for example, the S&P 500 Index has delivered a total return of exactly zero. AUSTIN — Fearing unstable international financial markets and the possibility of high inflation, Texas' higher education investment managers have bought more than $500 million in gold. Since we're talking about history; Did you know that the first pure Gold coins were struck by King Croesus of Lydia (present-day Turkey) during his reign between 560BC and 547BC--and gold coins have continued as legal tender ever since? Gold is and will always be the ultimate safe-haven currency or means of exchange. America's largest independant brokerage firm Raymond James, managing about $200 Billion in assets worldwide is still bullish on Gold. On July 4th the U.S.A. turned 234 years old. The US turned 234 years old yesterday, and yet over half of the nation’s money supply was created since Helicopter Ben took over the flight controls four years ago. No wonder gold is in a full-fledged bull market. – David A. Rosenberg, Chief Economist & Strategist, Gluskin Sheff & Associates Inc.
Could Russia And Europe Team-Up To Survive? When we have a concensus on a major trend and all the legendary investment newsletter writers, who answer to no one but their subscribers, like our personal favourite Bob Chapman and many others like Richard Russell, Harry Schultz, James Dines and Jim Willie , say that the market is in decline and GOLD is in a mjor bull market then you cannot say that no one warned you, or that no one knew this was coming. For years we have heard all kinds of excuses on market results that make people feel better after the fact. Question -- Russell, how do your studies of the primary trend affect gold? Answer -- The gold bull market will be no exception to my studies of the primary trend. Gold is indisputably in a great primary bull market. Gold moved into its second phase, the longest phase, and the one that starts to interest the crowd. But we haven't seen the crazy third phase of the gold bull market yet. The third phase is the manic phase where everyone wants in and speculation grows to insane proportions. I believe the third phase of the gold bull market lies ahead, maybe six months to a few years ahead. There's no way to time it. Understand this -- every item you buy, every trade you make, has a counter-party. I talked to a friend last night who was thrilled because he was heavily short the market. I asked him "Who's your counter-party for all these shorts?" He answered, "What are you talking about?" I replied, "If you make a killing on the short side, who's the counter-party, who's going to pay you your profits?" My friend turned white, "Gad, I see what you mean. I don't know who my counter-party is or whether they'll even be solvent if the market collapses." And that's where gold comes in. Gold is pure wealth. It hasn't been produced by any bank or corporation, Thus gold doesn't have a counter-party, nor does it need one. Gold can't be devalued or thrust into bankruptcy. This is the fact that gold-haters seem incapable of understanding. "Gold is no more than a barometer. It indicates the general feeling of security people have about other asset classes...If you feel safe, hold other assets. If you are concerned -- and let me tell you most people in the world are concerned -- then you move to Gold...The biggest driver of the Gold price is a fundamental lack of confidence in government." A highly successful and connected executive and founder of Barrick Gold, the largest Gold mining company in the world, Peter Munk surely understands what drives the Gold market better than most. Now watch the video below and decide if you have confidence in the U.S. economy.